The Utah Attorney General’s mission is to uphold the constitutions of the United States and the state of Utah, enforce the law, protect the interests of Utah, its people, environment, and resources. From violent crimes like domestic abuse and crimes towards children, keep families safe is a top priority. 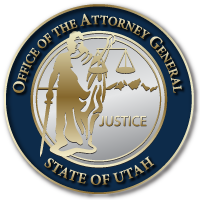 Our office prosecutes these crimes to the fullest extent of the law to help secure a safe living environment in for Utah families. Substance abuse affects many of our youth as well as other members of our society. From experimenting with medicinal drugs to hard, illegal substances, many are hurting themselves, their families and communities. Our office works to keep illegal substances off of the street and our communities safe from the dangers of drug abuse. Our office prosecutes those who do not follow current business laws. Business owners and consumers are protected from those who wish to abuse the law. This protection translates to a better business climate for Utahns. New businesses are encouraged to relocate to our state when they know they will be protected from white-collar fraudulent pursuits. Under Oath, the Utah Attorney General’s duty is to defend the State Constitution, ordinances and laws as Utah citizens or elected officials have enacted them. Efficiency and transparency are key components to the foundation of strong government. The ability for citizens to see what their representatives are doing is vital to prevent corruption. In selecting cases and enacting policies for the Attorney General’s Office, our office recognizes the diversity we enjoy in this State. From city to rural interests, energy and conservation projects and from pioneer stock to new residents, enforcement of our laws have far-reaching impact. General Reyes is committed to open door and open mind policies when assessing concerns from industries as diverse as mining, construction, agriculture, manufacturing and banking, finance, direct sales, hospitality, entertainment, professional services and high tech. Input from the people of Utah is vital because the Attorney General is the people’s attorney.